It’s World Breastfeeding Week! 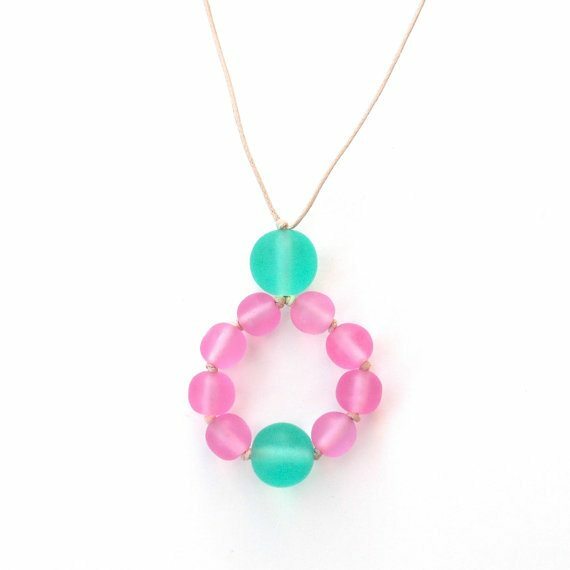 In celebration of this, I thought I’d share some beautiful necklaces that can be worn to entertain little hands when breastfeeding or babywearing. One of the great delights of a breastfeeding or babywearing necklace is not just that little hands are entertained, but the person wearing them gets to enjoy wearing a beautiful piece of jewellery that is (with supervision!) as baby-proof as jewellery gets. So here are some beauties that are well worth checking out. From Etsy, there are the creations of Monkey Mama Necklaces. These necklaces are made in the U.K. with beads that are made under Fair Trade conditions in Indonesia. So not only are they beautiful, they’re made with ethics in mind. For those outside the U.K., you may be pleased to note that Monkey Mama Necklaces ship worldwide. 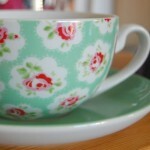 Also from Etsy, are the creations of The Vintage Honey Shop. These necklaces are made in the U.S. with wooden beads and fabric, and are simply gorgeous! These necklaces are truly beautiful and definitely cater to the adult desire for beautiful jewellery that can’t be wrecked (guess how I found that one out!). Once again, The Vintage Honey Shop ships worldwide, too. Over on Amazon, there are even more options available for breastfeeding jewellery! Teething Bling is available both through Amazon U.K. and Amazon U.S. 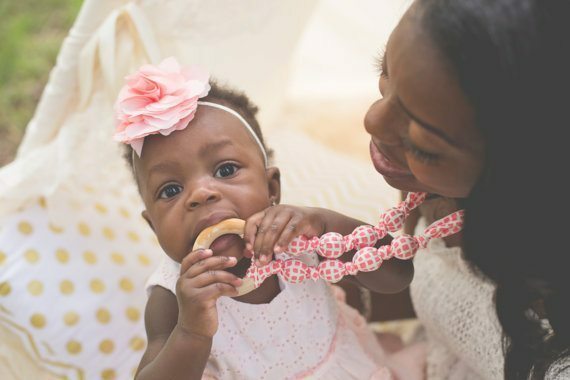 These necklaces are very chewable if that’s how your little one rolls, and they sparkle! I wonder if these are what breastfeeding unicorns wear. If Teething Bling isn’t what you’re looking for, Amazon U.S. has the gorgeous Silli Me Jewels. And back on Amazon U.K. there are the very cute Gumigem necklaces. And if you’re always on Facebook, you could check out Slingamebobs,who combine breastfeeding and babywearing with custom necklaces made from woven wraps! Well, that’s just a little round up of what’s available in the world of breastfeeding and babywearing jewellery, hopefully with a little something for everyone! And if your little feeds in a different way, these necklaces are still an excellent way of occupying those little hands! For information on breastfeeding, La Leche League International and The Breastfeeding Network are great resources. I’m bookmarking this post. My sister-in-law is having twins (GONNA BE AN AUNTIE!) and she’s so stylish-I think she’ll love some of these things! Previous Previous post: Did You Get Enough to Eat?